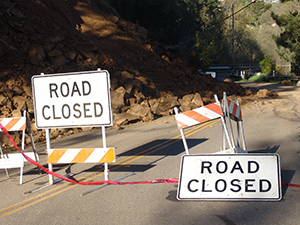 Landslides can occur quickly, often with little notice, and the best way to prepare is to stay informed about changes in and around your home that could signal that a landslide is likely to occur. In a landslide, masses of rock, earth, or debris move down a slope. Debris and mud flows are rivers of rock, earth, and other debris saturated with water. They develop when water rapidly accumulates in the ground, during heavy rainfall or rapid snowmelt, changing the earth into a flowing river of mud or “slurry.” They can flow rapidly, striking with little or no warning at avalanche speeds. They also can travel several miles from their source, growing in size as they pick up trees, boulders, cars, and other materials.